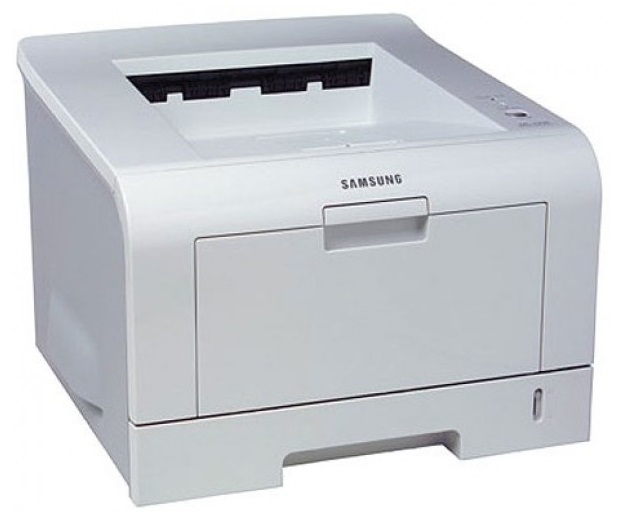 The Samsung ML-2251NP is a laser printer with monochrome capabilities that offers reasonable print times. It is suitable for small workgroups of one to three people or homes that need to produce projects, homework and letters on a regular basis. It can support a range of different media, including envelopes, transparencies and labels. The matte grey and glossy white finish give it a smart appearance, and this printer can be placed on a desktop for use. The Samsung ML-2251NP weighs 20.06lbs and measures 14.1 x 17.8 x 10.9 inches. Along the bottom edges, there are handgrips that make it easy to reposition as needed. There is a 250-sheet in-tray, which is helpful when a larger print job is in progress, and an auxiliary 50-sheet tray, which handles other media such as envelopes and labels. There is a parallel port and a USB 2.0 port, along with 16GB of memory, which is sufficient for modest print runs. Larger workgroups can choose to upgrade by slotting in a 144MB memory card in the reverse of the machine, but this is purchased as an additional extra. The monthly print yield of the Samsung ML-2251NP is 30,000 pages, and per minute it can produce 22 pages. As each sheet is used, the paper level indicator reveals how low the supplies are running, making it easier to gauge when top-ups are required. The resolution is 1200 x 1200 dpi. This printer is fully compatible with a range of operating systems, including Mac, Microsoft and Linux. To ensure that users can get set up quickly, there is an onscreen PDF and set-up guide included. There is also a CD to install drivers. The Samsung ML-2251NP cannot produce colour copies, and it needs accessories to increase its print capacity. Furthermore, this printer does not come with wireless functionality.